Lacroix made the opening statement before the Senate Standing Committee on Transport and Communications. 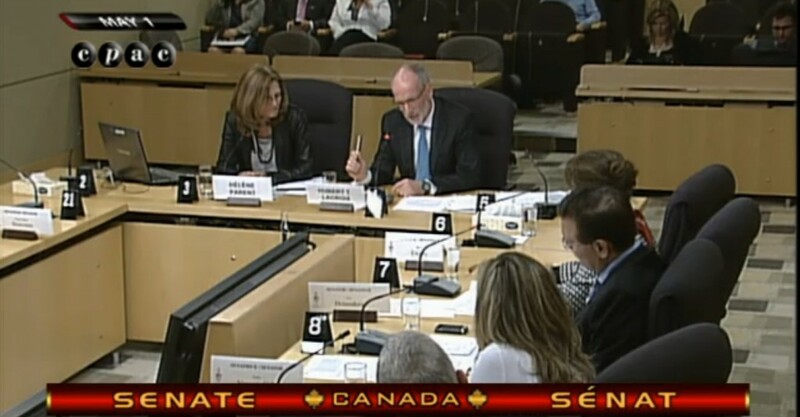 In the statement he addressed the question of why CBC/Radio-Canada, which manages RCI, cut 80% of the international broadcaster’s budget as part of the larger CBC/Radio-Canada cuts in 2012. What’s striking is the use of studies by Graham Mytton, formerly with BBC audience research, as justification for eliminating shortwave broadcasts at RCI as of June 25, 2012 in favour of the Internet. What’s also striking is the emphasis that both Lacroix and Parent put on the “new” website, almost as if there had not been one before, and conveniently not mentioning RCI was a pioneering leader on the Internet in addition to its shortwave, satellite and partnering with local broadcasters. Also surprising was the insistence that the Internet now gave RCI access to a bigger audience around the world. Most disturbing was the belief expressed by both Lacroix and Parent that RCI’s shortwave broadcasts could not be heard in Canada – they most certainly were. What was also disturbing was the overall sense from the testimony and the reaction of the senators that did speak, that the 80% budget cut was perhaps the best thing that happened to RCI, given this new website which only started in April, ten months after RCI has shutdown its shortwave radio broadcasts. The entire testimony of the two before the senators can be found on line here. The video of the testimony is here. Below are a few excerpts of the testimony. Please bear in mind that we are not in agreement with some of the interpretations, or even some of the facts presented to the Senators. Our decision to end shortwave broadcasts of RCI and move the service to the Internet was not an easy one, The reality is that the use of shortwave around the world has been declining since the end of the Cold War. That, combined with the growth of cellular phones, Internet, traditional radio and television, has led broadcasters around the world to cut back on their shortwave services, if they do maintain them at all. The trend is clear. While it is difficult to measure worldwide audiences to shortwave, a 2009 study by former BBC shortwave expert Graham Mytton identified a significant drop in shortwave listeners to Radio Canada International, beginning in the 1980s and continuing through the 1990s. He attributed the decline to the limited types of content offered and the very limited number of broadcast hours. In fact, that is one of the key advantages of moving RCI to the Internet. Because RCI did not provide round-the-clock programming on shortwave, listeners had to tune in at the right time during the day or night in order to catch the one hour of programming each day in English or French; the 30 minutes a day in Arabic, Mandarin, Spanish and Russian; and the 30 minutes each week in Portuguese. We would repeat these programs depending on the market. On the Internet our programs are available anywhere, at any time. They can also be downloaded and listened to later. We believe that transforming RCI into an interactive, Web-based service actually increases its value for Canadians at a lower cost. Furthermore, in countries where governments attempt to block access to foreign websites or shortwave transmissions, our local partners can download free audio content from a dedicated server. RCI also offers a daily cybermagazine available by email. You will find samples of these cybermagazines in your folders. Senator Greene: Tell me if this impression I have is right or wrong. You cut 80 per cent of the budget of Radio Canada International, but my impression is that the cut of 80 per cent has not diminished the service by 80 per cent because you have skilfully been able to expand your Web presence, et cetera. In terms of service delivery of Radio Canada International, where is it now, if you could estimate, in percentage terms with respect to where it was? Mr. Lacroix: You are absolutely right. I will ask Ms. Parent to come in here in a second. We think we are a much more relevant service because now, through social media and the Internet, we can actually know who the audience is. We can count clicks and we can count the presence. It was nearly impossible to do that in the shortwave world. Ms. Parent: What we want is to have a greater international presence, because Graham Mytton’s study told us that in 2009, Radio Canada International was no longer a relevant player over shortwave, and even recommended that we go over to the Internet. A few years later, especially given the cuts, this change had to be implemented faster. Ms. Parent: On the Radio Canada International website, you will note — and this is important for us — a link for our listeners. We are appealing to Internet users. On the right hand portion of the screen they are invited to share with us their comments as well as photos they take of Canada. As you know, our mandate is to raise Canada’s profile around the world. Mr. Lacroix: To answer your question, Senator Greene, you heard we are more connected to the audience in order to have the ability to follow the audience, to understand and connect with them so that we get feedback. When you transmit shortwave, there is no way in the world to know whether people are actually listening and whether they are on their little set at the exact time that your 30 minutes or hour is going through. We think this is a neat way to transform RCI, not to have made it disappear but to have transformed it into something that is easy to access, vibrant and in tune with the digital virage. Senator Eggleton: It is very impressive what you are demonstrating to us, but I want to go back to the topic of shortwave. I notice that a number of other broadcasters are reducing their shortwave, but some of them are keeping some of it, and I sense that it might be because there are people you cannot reach through these means. You pointed out, Mr. Lacroix, in your comments that in Africa, Internet access is only about 3 per cent. Then there is the question of oppressed countries, where people are denied Internet access. Throughout history, certainly modern-day history, one associates the ability to get to these people using shortwave means as being very important in expressing what Canada is about by getting Canadian stories and messages through hopefully to many of these people living in oppressed situations. Mr Lacroix: You talk about reaching people in these countries. We think that through the ability we have of delivering stuff through mobility and partnerships with local radio programmers in those countries — I will ask Ms. Parent to tell you more about this as well as the famous dedicated server. The numbers we have right now indicate that 3,000 hits — I am going to look for my number. People are coming to our site and downloading — here it is. Between September and November of 2012 on this famous dedicated server — which is a server available to our partners. If you are a partner of ours, let us say an organization in another country, you can come here, it is free, you download it and add it to the program that you have in your own country as programs coming from CBC/Radio-Canada. To show how relevant we are, we had 3,000 clicks from our partners where they downloaded this and incorporated that programming in their own stuff. Senator Verner: Thank you for your opening statement. It was clear and removed the drama which could have come with the cutbacks which were announced in the supplementary estimates for Radio-Canada and Radio Canada International. What happened to you almost constitutes good news. I don’t want to exaggerate, but what you have achieved is fairly extraordinary. My question follows on those asked by my colleagues. We know that in Africa mobile phones really are the best way to connect with others. In your opinion, do you reach more people this way than the traditional way? Ms. Parent: That is our objective and we firmly believe that we are going to reach more people. We also broadcast on the FM dial. Our partners broadcast on local radio stations. BBC and Voice of America can confirm this. But what is very important in Africa today is to be a presence on local FM radio. These radio stations broadcast our productions, and, for us, the fact of being available on mobile phones is really a significant step forward. Senator Verner: The fact that you were asked to make cutbacks in your budget in fact accelerated the process, because ultimately, when you look at what came of that, we could almost be tempted to ask you whether it should not have happened earlier. Ms. Parent: I believe the team from Radio Canada International was thinking about this thing for many years. Moving to the Internet, on the recommendation of Graham Mytton, was something we had started to do. This is not without precedent. We did have a website before, but it was a complement to our programming. But sometimes it is important to resort to creative thinking. Senator Unger: Thank you for your presentation. I would like to know a little bit about the audience that RCI had in terms of numbers, composition, age, region, country, et cetera, and how that has changed. You have been the voice of Canada for years, so I am just wondering about who these people are that will now be served by this new technology that, quite frankly, at my age, I would never be interested in. Mr. Lacroix: I will ask Hélène to tell you about our current listenership. It is difficult for us to tell you what it was before because we could not count. It was very difficult to count the number of people picking us up on shortwave because there was no connection. We had to rely on data that came and was delivered to us in a very incomplete way. With this technology, we can actually count now, and Ms. Parent will tell you who the audience is and whom we speak to. About 55 per cent are Canadians in Canada, and about 45 per cent are outside of Canada. Perhaps Ms. Parent can elaborate. Ms. Parent: Forty-five per cent of our listeners are abroad. We have not identified the profile of our Canadian listeners. People who listen to Radio Canada International are between 50 and 65 years old. They are educated. In fact, they are basically the same people who listen to CBC/Radio-Canada, but to be precise, 31 per cent of Canadians are aware of Radio Canada International, which is excellent, given the fact that Radio Canada International was not very wellknown and did not have a deep penetration rate in Canada in the past. It should said that with shortwave radio we were not broadcast in Canada and Canadians from diverse backgrounds did not have access to RCI content; now, we focus on people who know little or nothing about Canada, no matter their background. We focus on citizens of the world because with the Internet there are no borders. We still target the same audience, people around age 35 and older, people who want to educate themselves and learn, who have that ability to reach us. We are aware that for some, it is important to have a certain level of income, especially for Internet lines, except for wireless where now, in Africa, it has become accessible. We are targeting a much larger audience and we are targeting a Canadian audience, in addition. We did not have access to Canadians. Senator Housakos: Congratulations on the initiative and the presentation. I have mostly a comment to make, which you can speak to, and then I have a question. It is amazing how you have become innovative and efficient with 80 per cent less money and one third of the employees. You have managed to reach out using modern-day technology and technology that, over the last decade, has established itself as the way of the future. The question is, though, why did it take so long. The other question is that, as parliamentarians and as taxpayers, we would like our Crown corporations to be looking for initiatives to be able to become more efficient and the most cost-effective possible without having to have governments send down draconian envelopes to force our Crown corporations, be it the VIA Rails of this world or the CBCs of this world, to take cost-saving initiatives. This is an example of how a major, drastic cost cut has spun out to great innovation and positive results. That is a comment from my point of view. The other question I have, and forgive my ignorance, is how many shortwave radios were sold in Canada in the last year? What would be the number of shortwave radios that Canadians would possess living in the Middle East or Eastern Europe or wherever? Mr. Lacroix: Frankly, I have no clue. I cannot answer that question. Mr. Lacroix: They could not pick us up here, so that would not be helpful. Again, the entire testimony of the two before the senators can be found on line here. The video of the testimony is here.